From Eltham and Greenwich to the east of the capital and the Tower of London, Buckingham Palace, Whitehall and Westminster in the centre to Hampton Court and Kew to the west, London’s magnificent royal palaces, past and present, have always been places of beauty and power. Some remain working institutions and living homes; others have acquired new functions as show houses of history and art; all have remarkable tales to tell. 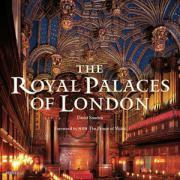 Sumptuously illustrated throughout, The Royal Palaces of London is the first major survey to bring together the stories of these buildings and the characters, events and art that have filled their grand spaces and intimate corners from the Norman Conquest to modern times. Brett Dolman is a curator of works of art at Historic Royal Palaces, specializing in the early modern period. Lucy Worsley is joint Chief Curator of Historic Royal Palaces. She is the author of several books, including If Walls Could Talk: An Intimate History of the Home (2011) and A Very British Murder (2013). She has presented numerous TV programmes about palace life and other history topics for the BBC.